Buy Alloy Jewelry from Yiwu China - Variety, Price, Quality, MOQ, and Some Tips. If you're looking to buy cheap alloy jewelry from China, but don't know from where to start, this article would help you with some solid information. Of course, as there are thousands of alloy jewelries from about 80 suppliers, I can’t list all of them here. Instead, I would just go for the main types of alloy jewelries so you can evaluate the potential using your own expertise. And, as the prices are fluctuating from time to time because of material price, labor cost, currency exchange, and market demands etc. The prices here can only serve as reference, NOT actual prices. 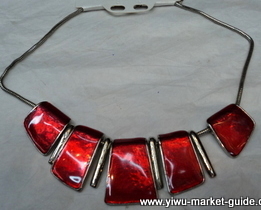 Jewelry business is the one of the most developed businesses in Yiwu. It has a history of about 25 years. Now thousands of small and big factories in and around Yiwu are either sampling, or producing finished products, or making parts and accessories, or designing, or packing, or assembling... even more companies in Yiwu are trading jewelry because more and more jewelries from other parts of China are coming to Yiwu. Yiwu now has all the basic facilities and all the services you need for making / trading jewelries. If you need cheap jewelries, come to Yiwu. In this article, i only about buy alloy jewelry. At least 800 shop are doing alloy jewelry on Floor 2, District one of the main market. There is another close-by market in the opposite of the market is also doing some alloy jewelries. These shops are wholesaling either on behalf of their own factory, or on behalf of other factories they represent. Variety is very good. Price of this whole alloy necklace is about 0.92 USD/per. 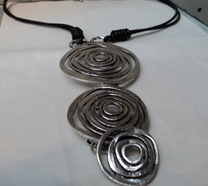 This alloy necklace is about 2.20USD/per. 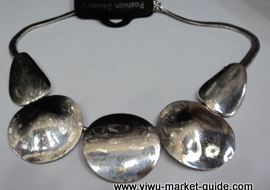 This big alloy necklace is about 1.85 USD/per. 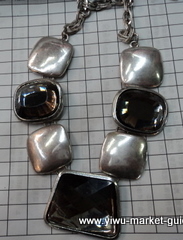 This heavy alloy necklace is about 2.35 USD/per. 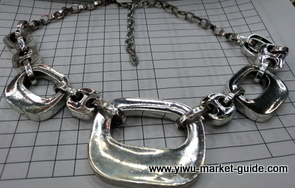 A heavy metal necklace in Yiwu market. 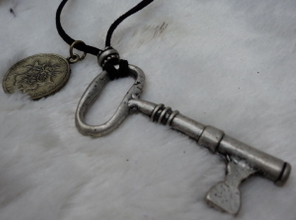 This heavy metal necklace is about 1.65 USD/pc. 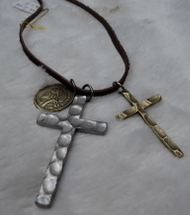 Necklace with 2 crosses, about 1.00 USD/per. this big alloy bracelet is bout 1.65 USD. This big alloy is ring only 0.38 USD / per. Alloy jewelry here are from low end to high end. They supplying different markets from mid-east to Africa. MOQ, in most cases, is about 10 dozens each design. Total purchase value about 350 USD. Many countries require jewelry to be nickel-free and lead-free. Some countries only ask for nickel-free. Only for nickel-free, the price can remain unchanged. But for lead-free, for some complicated parts, they ask for a very small extra money. Alloy jewelry are all pretty heavy, so they have to be packed in small heavy cartons with endurable plastic straps properly fixed. otherwise, the cartons can easily break. 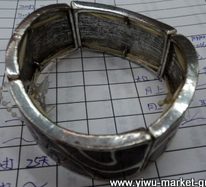 >> Return to buy from Yiwu from buy alloy jewelry from yiwu china.